To improve marketing and sales performance, OroCRM provides a tool that tracks user behavior data from your Magento Store. These events are recorded in OroCRM making it possible for you to track your customer activity. To be able to configure OroCRM Tracking extension, you need to have an active Magento integration. You can find information on Magento Integration in this section of the guide. You must be logged in to be able to download extension key. Once the extension has been downloaded, log in to your Magento admin panel. Navigate to System in the main menu and click Configuration. In the left menu, go to Customers section and click OroCRM. Enable Select Yes to enable OroCRM Tracking. Identifier This identifier should be the same as the identifier you will later enter on the OroCRM side. Identifiers on the Magento and OroCRM side should coincide. Note: Tracking script may not work properly on secure (https) pages if OroCRM is installed on a non-secure host. Click Save Config to save your configuration on the Magento side. Now that you have installed OroCRM Tracking extension, you can create a Tracking Website record in OroCRM. If Tracking Websites is unavailable in the Marketing section of the main menu, make sure you have Tracking enabled. Please, contact your administrator if you are experiencing any trouble. Owner Limits the list of users who can manage the tracking website record to the users whose roles allow managing tracking-websites of the owner (e.g. the owner, members of the same business unit, system administrator, etc.). Identifier Unique code of the website used to generate its tracking. Identifiers in OroCRM and Magento should have the same name. URL URL of the website to be tracked, e.g. your Store Magento. Channel Select an active Magento channel. Connecting a tracking record with a channel in the system binds events registered by the tracking engine and other CRM data like orders, shopping carts, customer profiles, etc. This connection can be further utilized in reports and segments. Once you have completed filling in the Create Website Record form, click Save and Close. As soon as you have configured website tracking, you should be able to see customer activity in the Events section of the tracking website record you have just created. You can use data collected from your Magento store in a number of ways, creating reports and segments of users according to your needs. Building segments of your customers is one of many ways of using data collected through web tracking. As an example, let us build a segment of users who have not visited the website for more than a month. To do this, go to Reports and Segments>Manage Segments and click Create Segment. Drag a Field Condition to the field on the right to set conditions to the segment. Select Magento Customer/Magento Customer (Visitor event)/Web event>Logged at. Set the following variables: not between today and today-30 as illustrated in the screenshot below. When you are done, click Save and Close. 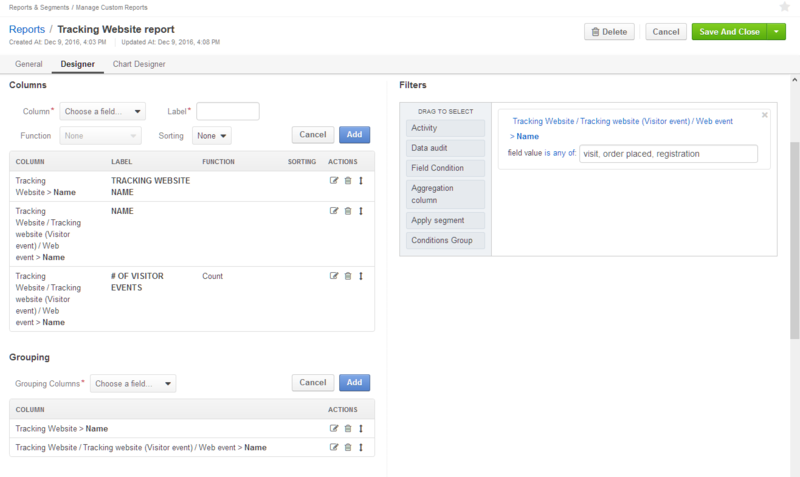 The segment will appear on the Manage Segments page and contain customers sorted according to your conditions. Another example of using data, collected with the help of web tracking, is creating reports. 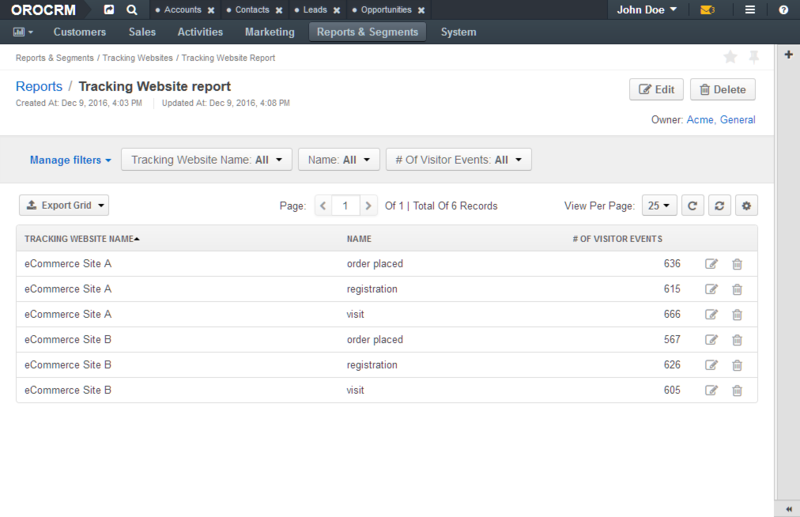 Let us create a report that will display how many users have visited your websites, registered and placed their orders. For entity type select Tracking Website. Tracking Website/Tracking website (Visitor event)/Web event>Name, field value is any of visit, registration, order placed. In similar manner, using website tracking data, you can create custom reports that fit specifically your needs and the needs of your business.